This cookbook does support upgrade between major versions (Read doc). Control upgrade requires variables to be set before running. Full list of attributes can be found here. We only support 1 cassandra POD. Once the metrics addon is deployed, it creates a flag (openshift_hosted_metrics_flag) on the first master to avoid having CHEF re-creating the resources over and over. Any option can be set, as long as they are supported by the current Logging deployer template. We only support 1 elasticsearch POD. 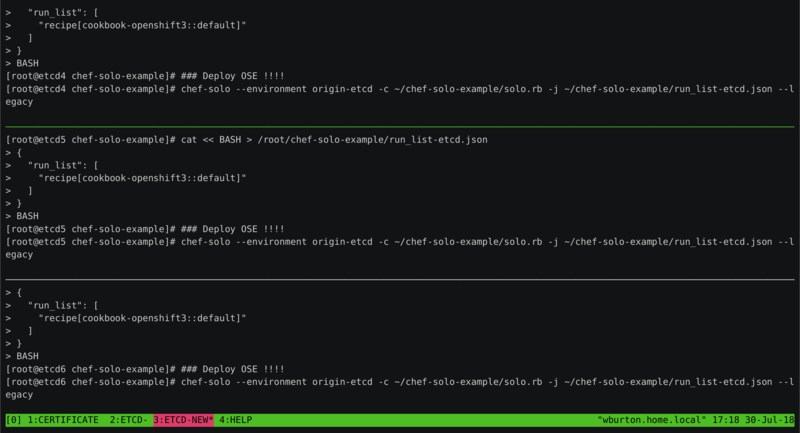 Once the logging addon is deployed, it creates a flag (openshift_hosted_logging_flag) on the first master to avoid having CHEF re-creating the resources over and over. Example of overriding the default kubelet options: * node['cookbook-openshift3']['openshift_node_kubelet_args_custom'] Any option can be set, as long as they are supported by current Kubelet Options. Any ENV options can be set for the sharding router, as long as they are supported by the current documentation Set ENV for router sharding. enable A boolean to enable or disable audit logs. Default is false. audit-file File path where the requests should be logged to. If not set, logs are printed to master logs. max-retention-day Specifies maximum number of days to retain old audit log files based on the time stamp encoded in their filename. max-file-number Specifies the maximum number of old audit log files to retain. max-file-size Specifies maximum size in megabytes of the log file before it gets rotated. Defaults to 100MB. Example of overriding the setting for global builds: Any option can be set, as long as they are supported by current Global Build Defaults and Overrides. If OpenShift Container Platform administrators would like to control the level of overcommit and manage container density on nodes, masters can be configured to override the ratio between request and limit set on developer containers. This requires configuring the ClusterResourceOverride variables. Admission control plug-ins intercept requests to the master API prior to persistence of a resource, but after the request is authenticated and authorised. The redeployment of the certificates requires variables and flags to be set before running. Make sure the ETCD set that you wish to keep is not part of the remove_etcd_servers group!!! If it the case the removal operation will be skipped. Make SWAP disabling on nodes optional (but enabled by default). Fix issue with cloud_provider when restarting node service. All tgz files are encrypted with a default passphrase, and decrypted at the other end after downloading. Remove duplicated code between etcd_cluster and master_cluster recipes. Enable *-master-controllers and *-master-api services on master nodes.